Today is National Toast Day. For every person who goes onto: http://www.facebook.com/gayleafoods on March 23rd and signs the petition to “Stop Toast Brutality” Gay Lea will donate a tub of Spreadables butter to the Calgary Inter-Faith Food Bank. “Hunger is an issue affecting many people across Canada. National Toast Day sets the stage for Gay Lea and the community to come together and help Canadians in a fun and interactive way,” says Carol Johnston, director of marketing at Gay Lea Foods. 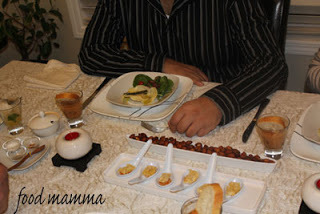 We had a wonderful dinner party this past weekend. 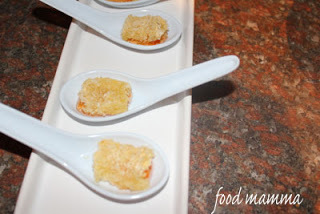 After watching Giada’s Progressive Dinner, I thought it would be such a fun thing to do! A three course meal at three different houses – it was a perfect event to do with our close friends who live minutes away. It was bound to be an interesting evening since we weren’t coordinating our menus. We started with appetizers and cocktails at our house. Hubby was in charge of the cocktail and came up with an orange / nectarine mojito. 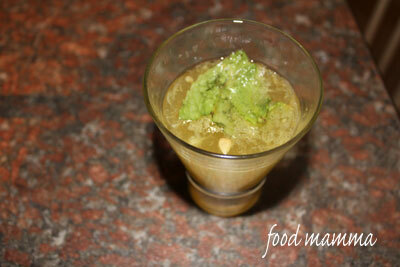 With all the citrus and the mint, the drink was delicious and so fresh. It was hard to decide on just one appetizer so I made a few. Rosemary almonds were placed on the table for people to munch on. It was nice to see that these were a big hit. Since I had just had my lesson in making butternut squash ravioli, I definitely had to make a batch. 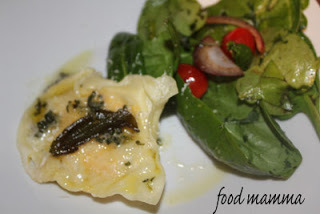 Everyone was served one big ravioli with a serving of greens. The idea of the progressive dinner came shortly before we visited Kayne‘s a few months ago. I knew after tasting their brie, I had to have something similar. I didn’t want to fry anything so I baked some panko breaded brie which was served on top of red pepper jelly. The final appy was a shrimp dish. 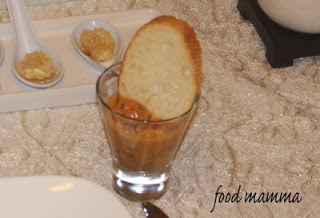 Sauteed shrimp in a red pepper cream sauce served with baguette. It’s a dish that I had at a restaurant recently and I was happy to find the recipe online. We hopped into our cars and drove a few minutes to the next house for dinner. 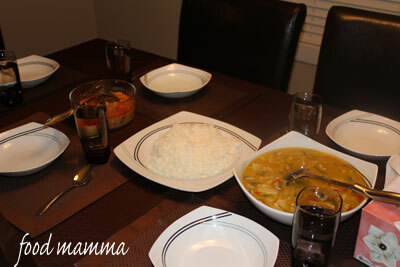 S and P had made an amazing thai dinner with both green curry and a spicy red curry. 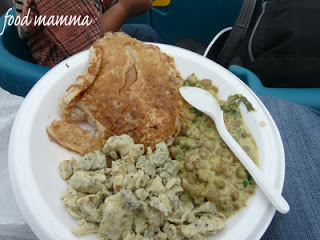 This was served with rice and was enjoyed by all, even the kiddies. We then headed around the corner to S and G’s house where we indulged in two desserts. 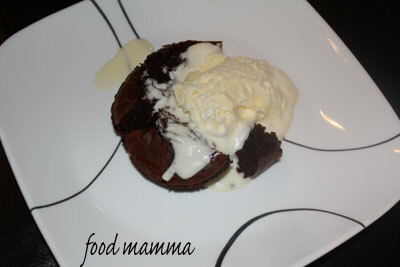 Molten lava cake served with ice cream was the chocolate contribution of the night. 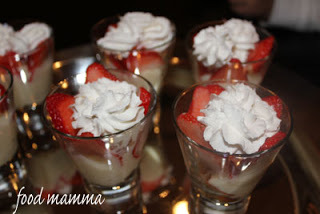 The other dessert was a concoction prepared by S with lemon pound cake, custard and strawberries – delicious! It was a fun evening and a nice way for everyone to contribute without doing a potluck. Looking forward to many more of these dinners! January 24 is Peanut Butter Day! This month, Lauren of Celiac Teen is hosting the monthly event, Go Ahead Honey It’s Gluten-Free (GAHIGF). A theme is chosen each month and based on that theme, bloggers create gluten-free dishes. Lauren’s theme is “Follow the Calendar”, where you pick a food holiday and make a recipe celebrating it. 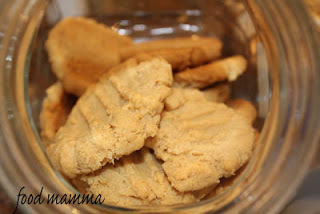 I just happened to have made peanut butter cookies the day I read Lauren’s post and thought it would be the perfect thing to blog about. 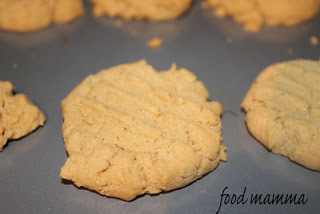 This is the easiest cookie recipe with no flour and no butter. Only 4 ingredients are needed and the cookies turn out delicious! You know something is good when my 2 year old asks for more. Beat the peanut butter and sugar until the 2 ingredients are incorporated and fluffy. In a separate bowl, beat the egg with the baking soda. Add to the peanut butter mixture. Drop by spoonfuls onto an ungreased cookie sheet and bake at 350 degrees for 10 minutes. Makes about 30 small cookies. 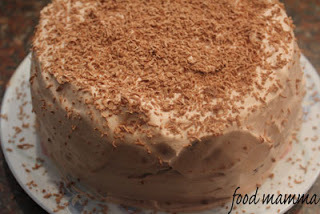 chocolate cake with nutella whip icing: happy birthday mom! Today is my mom’s birthday! My mother is known for her wonderful cakes and she is kind enough to make them for all of our birthdays. I felt that she definitely deserved to have someone make a cake for her, so Q and I took on the task. I couldn’t decide what to make but Q said chocolate so chocolate it was! 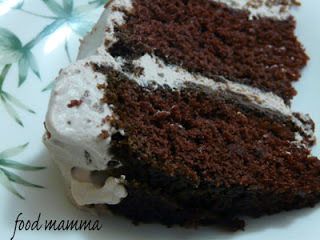 The recipe I used was Kraft’s Best Ever Chocolate Cake. I wanted a lighter icing though and thought what could be better than chocolately nutella and airy whipping cream. 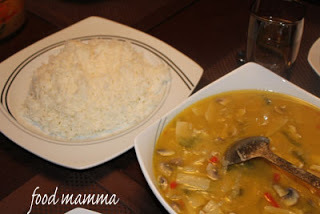 We tried it out and the combination was delicious! Along with the cream, I added a layer of nutella between the two layers as well. Sprinkled with some grated chocolate chocolate, it was the perfect way to celebrate a classy lady. Happy Birthday Mom! Love you! Grease and flour 2 (9-inch) round pans. Beat all cake ingredients except eggs in large bowl with mixer 2 min. or until well blended. Add eggs; beat 2 min. Pour into prepared pans. Bake 35 to 40 min. or until toothpick inserted in centres comes out clean. Cool 10 min. ; remove to wire racks. Cool completely. Whip the cream until doubled in volume but right before soft peaks are formed. Heat the nutella and gently fold into the cream and beat until completely whipped. Refrigerate until ready for the cake. It’s Stampede time in our beautiful city of Calgary, which means an abundance of pancakes, cowboy hats and country music. For 10 days, people come together to celebrate “The Greatest Outdoor Show on Earth“. It was so great to have friends and co-workers join us at this event. Everyone enjoyed the pancakes, eggs and bharazi – an East African dish of pigeon peas in coconut curry. Since so many requested the recipe, I called up my aunt who is on the catering committee and she shared the recipe which is below. She is a genius at cooking and she was able to rattle the recipe off in seconds. Cook the onion in oil until softened. Add the tomatoes, spices and milk and cook until mixture starts boiling. Add peas and cook until curry thickens. Finish the dish off with a generous amount of cilantro.